Stunning home... At the end of a quiet cul-de-sac... close to the beach... The gated courtyard leads you to the entry inviting you into the grand foyer with marble flooring. Step down to the elegant living room with hardwood floors, recessed lighting, fireplace, and a soaring dramatic ceiling with double crown moulding. Enjoy your dining experiences in the elegant formal dining room. The gourmet kitchen is open to the family room and features top of the line stainless steel appliances, sleek granite counters, a center island and a spacious walk-in pantry. Your family room has a custom fireplace, plus a great surround sound system to enhance your listening enjoyment. A downstairs bedroom with a private bath, is currently being used for an office. Private resort style living in your backyard is truly an entertainer's tropical paradise. 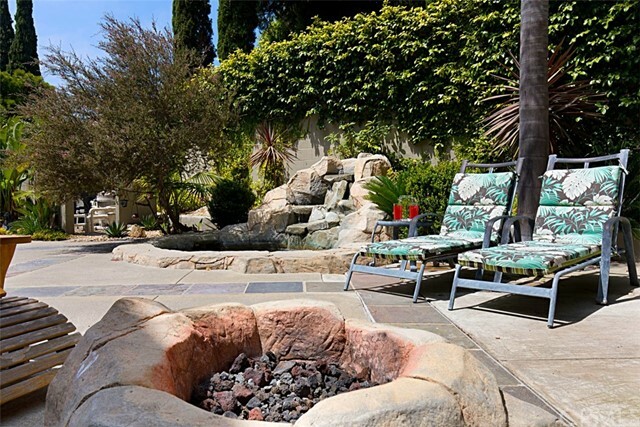 Beautifully landscaped with multiple Palm trees, a built-in barbecue island, relax in your custom rock spa with waterfall, and gather around the gas firepit. Upstairs is your Master Suite with a fireplace, walk-in closet, and a balcony overlooking the backyard. At the end of the day, relax in your sunken tub, or the oversized glass enclosed walk-in shower in your private Master Bathroom. Three additional bedrooms and two additional bathrooms complete the second level. An executive home with a 3-car garage. A short distance to the beach, Pacific City, and Seacliff Country Club. Coastal living at its finest!